Sparkling Strawberry Smoothie-bright red strawberries are packed with vitamin C. They also contain heart-healthy omega-3 fatty acids and belly-filling fiber. With more than 300 colorful, vitamin-packed smoothies to choose from, you'll blend, smooth, and shake your way to a healthy new you! 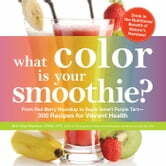 Books related to What Color is Your Smoothie? Eat To Live Diet Reloaded : 70 Top Eat To Live Recipes You Will Love !